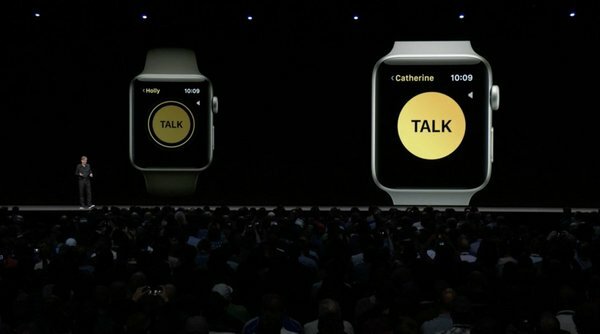 To talk to Siri on Watch, you have to raise your wrist and say Hey Siri. We're bringing the social cue to watch, so that you don't have to say Hey Siri - you just raise your wrist. Notifications become interactive - you can see the airline checkin notification and tap to check in. When you finish a ridesharing ride, you can tap to pay from the watch. Web content on the wrist. "We don't think full web content is appropriate on the watch, but there are times you want to see something, so we have the ability to format it for the small screen and show you what you need." Podcasts is coming to Apple Watch. Subscribed podcasts are synced to the watch, or Siri can stream them for you. Playback is synced across devices. Stay connected with people you care most about: WatchOS 5. Lynch is running a live demo with Jewels, who runs the fitness experience. She demos it while biking. She taps her watch to the exercise bike, accepts on the watch, to start the workout from the console on the bike. The data is synced, the workout metrics are accurage. She demos activity competitions. She has a competition with Jay, is in day 7, and it says, "have you got what it takes to win?" Jay has moved ahead by a couple of points. She adds resistance to the bike, and taps to send him some smack talk to let him know she's coming for him. She taps on Yelp notifications to confirm a reservation. She has some grouped message notifications. She taps the link in a notification and sees the preview. All from the wrist. She demos Siri watch face. She can tap on the workout that's at the top of the face. She also taps on Glow Baby to see if her child's nap is logged. Scrolling through the day, she sees meetings, traffic, the dinner for her calendar, and a shortcut to her evening meditation, 10% Happier. She uses Walkie-Talkie to speak to her daughter... from the stage on an exercise bike. "Mommy, I see you on TV!" Siri Shortcuts makes for a rich experience on Watch OS. Also new, third party apps can play background audio. This way, you can sync guided meditations or audiobooks and keep playing them in the background. 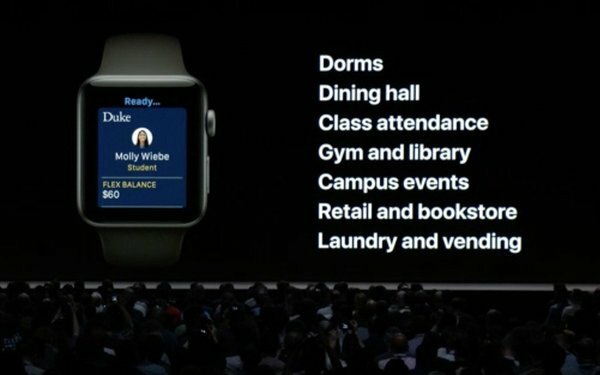 Student ID cards for RFID / NFC can now be added to Apple Watch. Paying for things in the student union, accessing dorms, become simple from the watch. Starting with an initial list of universities, and then expanding. And, it's Pride month, so there's a new Pride face and Apple Watch band to match. Tim is back. 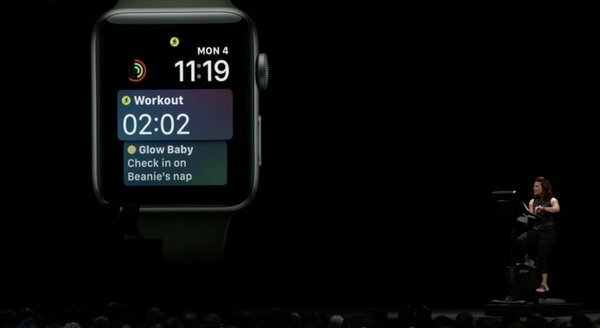 "WatchOS keeps getting better and better, and we're excited for you to try these features to keep more active and more connected." AppleTV 4k! The Apple TV business has grown 50% year on year. Jen Folse, Apple TV lead designer comes to the stage. tvOS is built specifically for the living room to make it easy to enjoy your shows, movies, apps and games. Last year we introduced Apple TV 4K with support for HDR10 and Dolby Vision. iTunes offers the largest collection of 4K HDR movies. We've upgraded previously purchased movies to HDR 4K on all movies. AppleTV 4K is bringing you the latest in audio technology: Dolby Atmos. With Atmos, you get room filling sound, the perfect complement to the stunning visuals of AppleTV 4K. With Atmos, you have the ability to move sound in 3D space, creating audio that flows all around you. All of this is done with a Dolby Atmos soundbar and Apple TV 4K. It is the only streaming device that has both Dolby Vision and Dolby Atmos. Your iTunes library will be updated to Atmos on all supported titles for free. The TV app is the center of your video experience: a single place to find and experience shows you love across Apple TV, iPhone and iPad. It has not just streamed content, but live sports. We've added live news, bringing you over 100+ channels, making Apple TV the best box to watch TV. The cable box is becoming a thing of the past, and the cable companies share our vision of AppleTV as the one device to watch live TV. We're partnered with Canal+ in France. In Switzerland, Salt. is partnered exclusively with Apple. Later this year, Charter Spectrum will be coming to AppleTV. 50 Million homes will be able to use AppleTV, TV app, and Siri to access all their TV services. Apple introduces Zero Sign On. If you're on your TV provider's broadband network, we unlock all the apps associated with your TV service. No credentials needed, it just works. Charter Spectrum will be the first provider to do this, and more will follow. Working with Crestron, Savant, and Control4 to support AppleTV and Siri. This fall, with a tap of the Siri remote, you can see the location where an aerial screensaver was shot, and swipe between locations to see more. For the past year, they've been collaborating to film amazing footage from around the world. And now, aerials of Earth, filmed by astronauts from the International Space Station. The Space Station makes an orbit every 90 minutes. They have 16 sunrises and sunsets every day. Apple TV is the one place to find all your TV, Movies, Sports, and News. "We love the Mac. The Mac is the first computer that made powerful technology so easy to use and put the customer at the center of the experience. For more than 30 years, the Mac has empowered people to create all kinds of amazing things. From the personal to the professional." The next version of macOS is full of features inspired by professionals, but designed for users. " "We want as many users as possible to have access to Mac software." Craig is reciting the history of Mavericks, Yosemite. Four years of mountain names! "This year, we've made striking changes to macOS. We've left the high country. I'd like to take you there now." Mojave is beautiful during the day, but what really captured our imagination is the beauty of the desert at night. This inspired a distinctive new feature. Here we are live in macOS Mojave... with a new side of macOS - we call it dark mode. It extends to the windows chrome, the sidebar, the content of the windows, the dock. It makes photographic content pop off the screen. If you work in a dark environment, if you're working on keynotes, your album art, your calendar, your emojis.. they all look great. And XCode looks great in dark mode. Whether it's source code or interface builder, they look fantastic in dark mode. We were so inspired by changing wallpaper, we created a new feature called Dynamic Desktop. Your desktop changes throughout the day, from morning to afternoon, to night. The Desktop is so crucial to how we work. People put files on the desktop. Now we have Desktop Stacks, to prevent desktop clutter. All the content is arranged in stacks by kind, date, or tag. Click on one, all the contents in a stack, double click to open a document, and the stacks stay organized. And of course, you can drag and drop from stacks, and the item dragged snaps back in. Finder gets changes too. It starts with a new view. We use icon view, list view, column view, and now there's Gallery view. It's a giant preview up top, thumbnails at the bottom, making it easy to preview images, video, documents, pdfs, and with images, you can see in the side bar all the metadata of a photo. There are also quick actions at the bottom of the thumbnail view. You can rotate an image right within Finder. The Quick Actions area is contextual. You can multi-select and create a PDF. These actions are customizable. You could create Automator actions and assign them to buttons in Finder Quick Actions. Quick Look is getting some attention. Quick Look has markup integrated into it. You can quick look a pdf and click on Markup, sign the document, right inside quick look. It's also possible to trim video in Quick Look. Screenshots are more powerful than ever in Mojave. Craig screenshots a web page selection. Just as in iOS, you get a thumbnail of the screenshot with markup tools if you click on it. When you use the screenshot, you can actually capture a video recording of the screen as well. You get the thumbnail and can drag it into a new space, without opening the markup tools. Screenshot works with Continuity. Continuity Camera lets you use your phone - if you have a keynote document with space for a photo, you can click on it, and the camera will open on the iPhone, you'll take the photo, tap Use Photo, and the photo will use Continuity to come back to the Mac. You can do this with scanning documents, too. Photos, stills, videos, and Continuity Camera. All in Mojave. Apps! News app is coming to the Mac. All the stories from iOS News, on the Mac. Top Stories. Trending Stories. Personalized Feed, and a sidebar to drill into the topics and channels you follow. Stocks is also coming to the Mac. Stock prices with high quality business news.